Heat oven to 350°F (325°F for dark or nonstick pan). Line 13x9-inch pan with foil, letting foil hang 2 inches over sides of pan. Grease bottom only of foil with shortening or cooking spray. Using foil to lift, remove brownies from pan. 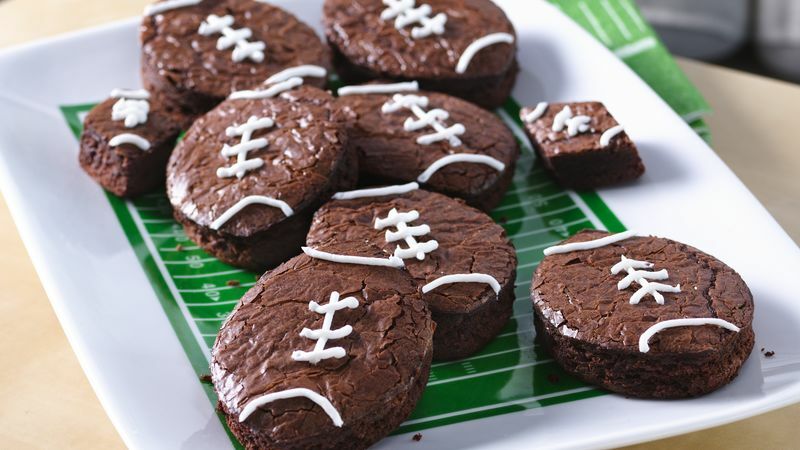 With 3 1/2x2 inch football-shaped cookie cutter, cut brownies into football shapes. Pipe on decorating icing to look like football laces. Use the exact size of pan called for in a recipe when baking bars. Bars made in pans that are too big become hard and overcooked, and those made in pans that are too small can be doughy in the center and hard on the edges. Shiny metal pans are recommended for baking bars. They reflect the heat and prevent the bottom from getting too brown and hard. Follow the manufacturer’s directions when using dark, nonstick or glass baking pans; they may recommend you reduce the oven temperature by 25°F. Check for doneness 3 to 5 minutes before the minimum bake time given in the recipe. Lining baking pans for bars with foil means quicker cleanup and also makes it easier to cut bars. To line baking pans with foil, turn the pan upside down. Tear off a piece of foil longer than the pan. Smooth the foil around the pan bottom and then remove. Flip the pan over, and gently fit the shaped foil into the pan. When the bars or brownies are cool, lift them out of the pan by the foil “handles,” peel back the foil and cut the bars as directed. Grease a pan only when the recipe calls for it. Grease baking pans with shortening or cooking spray. Unless the recipe directs, do not use butter, margarine or oil, because the area between the cookies might burn during baking. Pans can sometimes get scratched when bars are cut with a metal knife, so try a plastic knife. In fact, a plastic knife works best for cutting brownies and soft, sticky bars. When determining brownie doneness, note that brownies will start to pull away from the sides of the pan when done. No football cookie cutter? You can use a knife. Just cut the brownies into 12 rectangles (4 rows by 3 rows). Trim corners of each rectangle to make a football shape. For smaller footballs, cut brownies into 2x1-inch rectangles and trim to make football shapes.